Mason jar salads have many benefits. They can take the boredom out of your lunchtime routine, they're packed with nutrient-dense foods, and they can give you the opportunity to use your lunch hour for a brisk walk or a yoga class. Here are some tips for prepping your vegetables and packing a mason jar to keep salads fresh for up to seven days when you start with market fresh ingredients. So pull out the jars and let the cutting and layering begin! 32-ounce mason jars are preferred over the 16-ounce size because it's easier to fill and easier to dump out. 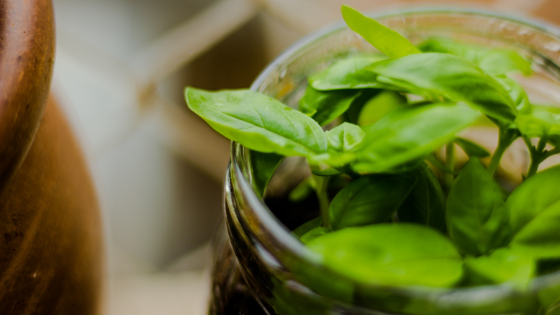 Mason jars seal tighter so delicate salads stay fresher, longer and won't absorb odors which plastic may. If you don't have mason jars, any glass jar with lids that fit tightly will do the trick. Squirt lime or lemon juice on avocado before packing to keep it's fresh color, texture, and taste. First, add the heartier veggies like carrots, cauliflower, celery, cucumbers, peppers, red onion, etc. Your protein layer will usually be cubed or crumbled cheese, diced roasted chicken, shrimp, or boiled eggs. The final, top layer is lettuce, nuts, and seeds – far away from the dressing to stay crispy and crunchy. Mediterranean Jar Salad – Epicurious brings the Mediterranean diet to an easy to assemble mason jar version of a Greek salad featuring tomatoes, orzo, olives, red onion, and cucumber; and salty crumbles of feta cheese. Shrimp and Feta Salad – This unique salad will gather your favorites into a refreshing summer-time feast, including savory thyme, cooked shrimp, and chopped avocado. Martha Stewart Salad Dressing - Explore this list of easy and tasty salad dressings that will kick your mason jar salads into high gear. Just a few ingredients are shaken in a jar and added to the bottom of mason jar salads. Looking for a new apartment home in Phoenix, Arizona. Element at Deer Valley features a wide choice of floor plans from studio to four-bedroom apartments. Enjoy making your own mason jar salad creations in our lovely, designer kitchens that feature stainless steel appliances and professional flooring.